Pink balloons for a girl, blue balloons for a boy, and multi-coloured balloons for two very annoyed parents-to-be at their gender reveal party. 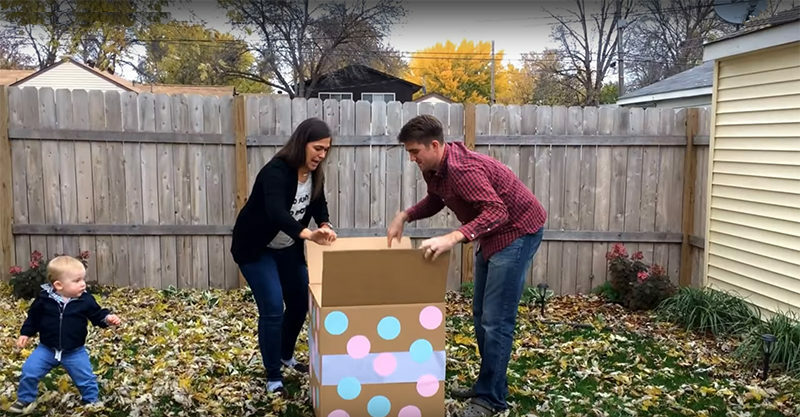 Minnesota couple, Leela and Joe Krummel are expecting a baby, and as is the trend these days, they decided to have a gender reveal party with their friends and family. Thirty people gathered to watch the couple open an oversized cardboard box. If blue balloons floated out, they were having a boy. If the balloons were pink, they were having a girl. No one knew the gender of the baby, not even Joe and Leela. They couple had given the doctor’s report straight to the balloon shop. Clearly no one at the shop had ever had kids, because a well-meaning employee filled the box with multi-coloured balloons. Maybe they thought all the colours were more festive. As the balloons float out, guests erupt into laughter and applause, but Leela is clearly irritated, proving once again that you shouldn’t cross a pregnant woman. A further check revealed the doctor’s envelope hidden under the flap of the box. Some quick-thinking, industrious friends took the box and remade the reveal with some spare party supplies, this time with the right colour of balloons. The next clip shows the couple reopening the box. A cluster of blue balloons floats out to much fanfare. Joe and Leela can take this experience as their first lesson in how life with kids never goes as you planned.